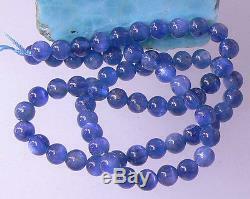 RARE NATURAL CHATOTANT BLUE 6mm ROUND KYANITE BEADS STRAND 15.75 143.5ctw. 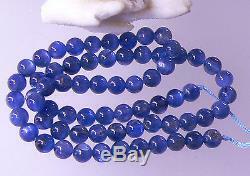 67 AMAZINGLY BEAUTIFUL NATURAL I BLUE SMOOTH ROUND KYANITE BEADS! HAND CARVED INTO THIS PERFECT ROUND SHAPE!! 100% NATURAL UNTREATED ICY BLUE COLOR!! 143.5 CARAT TOTAL WEIGHT!! The KYANITES measure 6mm DIAMETER!! AMAZING 100% NATURAL UNTREATED COLOR!!! Perfect to your Custom jewelry or Collection! I HAVE GREAT SELECTION OF FINE JEWELRY, NATURAL DIAMONDS, UNIQUE GEMSTONES, FRESHWATER AND TAHITIAN SOUTH SEA PEARLS!! 5 0 for each additional item ships in the same package (must be paid together). We WANT HAPPY CUSTOMERS ONLY! 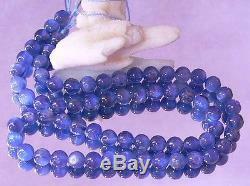 The item "RARE NATURAL CHATOTANT BLUE 6mm ROUND KYANITE BEADS STRAND 15.75 143.5cts AAA" is in sale since Sunday, July 7, 2013. This item is in the category "Jewelry & Watches\Loose Beads\Stone".